The papers collected here were originally presented to the eighteenth Leeds Symposium on Food History as ‘The Changing Face of Food’. The inspiration for the day came from Prospect Books’ series under the general heading ‘The English Kitchen’, and that title has been given to this publication. ‘English’ in this case means the language in which the recipes are written rather than marking national boundaries. Individual chapters reflect the enthusiasm of the contributors and do not cover the fall range of food in Britain. Readers may be inspired to take their own item of food and track its progress through the ages. A single dish can reflect the changing taste of a nation, from the use of a proflision of spices and a mixture of sweet and savoury, to a deliberate limitation of flavours and division of dishes into specific courses. As literacy grew, and printed books became easily affordable, the recipes took in the simpler meals of all classes of society. They also reveal the gradual incorporation of ready-made flavours and thickeners, and the industrial provision of food that leaves little for the cook to do. The contributors have made use of dictionary definitions in beginning their examination of a particular dish, but these definitions are framed by lexicographers rather than cooks. The next step is to consult the recipe books themselves, and favourites have emerged in the following chapters. Many are available in modern transcriptions, editions or facsimiles, starting with medieval manuscripts care of the Early English Text Society and taking in the writings of Thomas Dawson, John Murrell, Robert May, Hannah Glasse, Martha Bradley and Eliza Acton. More books popular with contributors, available in collections such as those in the Brotherton Library of Leeds University, include Gervase Markham and Hannah Wolley. Mrs Beeton’s original publication of 1861 is available in facsimile, and Mrs A.B. Marshall is becoming better known through the work of her present-day admirers. Publications of personal manuscripts, such as those of Elinor Fettiplace, Rebecca Price and John Evelyn, help to give a more domestic view of what was prepared in the English kitchen. Samuel Pepys and Grisell Baillie offer examples of meals actually eaten. Unpublished cookery manuscripts in private collections or public record offices will provide further examples of different dishes evolving over several generations. It is hoped that the following chapters will prompt others to track a favourite recipe as it evolved to suit tastes, availability of ingredients and technical advances in kitchen equipment. The introduction by Tom Jaine poses the question lying behind the other chapters: is there something that can be defined as English cookery? The example he gives of produce available in a particular area, constrained by geographical formations, shows how the problem of feeding a family in ways suited to the locality can be dealt with creatively. 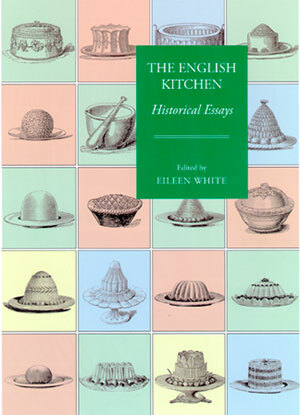 In this book we celebrate a few of the items that have been provided in the English kitchen for the English table.